of the Canadian Olympic women's hockey team. he said he had some unfinished business at the Olympics. 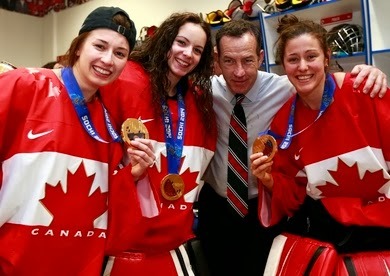 Well a few weeks ago in Sochi, Russia, Dineen completed his Olympic journey as the Canadian women mounted a stirring comeback to win the gold medal in overtime. It took me back 30 years, to the 1984 Winter Olympics in Sarajevo, Yugoslavia. There was no women’s hockey, and the men’s game was vastly different. Professionals were barred from playing, effectively keeping out Canada’s biggest and brightest players. Meanwhile, the Soviet Union dominated, skirting around this rule by saying their players were not paid to play, even though they played together virtually year-round and hockey was their full-time job. Canada had reacted in various ways to this situation. At one point, we even refused to send teams, ending that boycott in 1980 at the Winter Olympics in Lake Placid, New York, best known for the American hockey team’s “Miracle on Ice” gold medal victory. 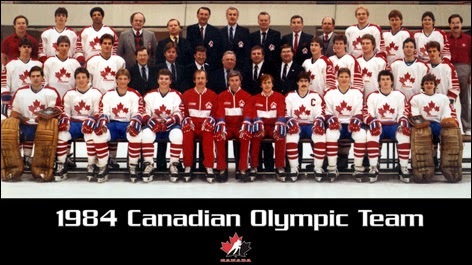 The 1984 Canadian Olympic hockey team. 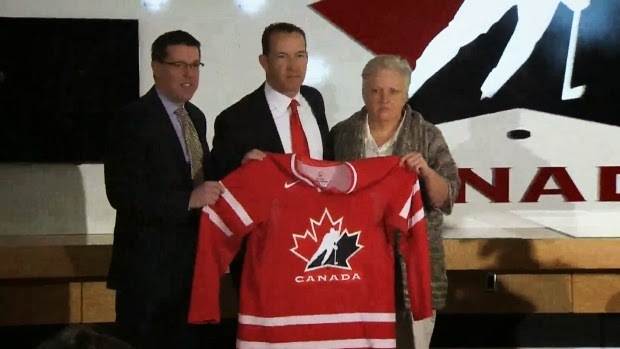 Things changed for Canadian Olympic hockey with the arrival of coach Dave King. He had been successful at the junior and university level, and guided Canada to its first-ever World Junior hockey gold medal in 1982. After he joined the Olympic program, a renaissance dawned. Back then, the team was based in Calgary and played virtually year round. However, the players had to maintain their amateur status, which meant they could not get paid, so a lot came and went, as the pros came calling – especially when they were making playoff runs. The 1984 team saw a shift begin, as a number of high draft choices joined Team Canada, and a few NHL teams let their prospects play for their country. That meant expectations were higher when the boys travelled to Sarajevo then they had been in a long time. 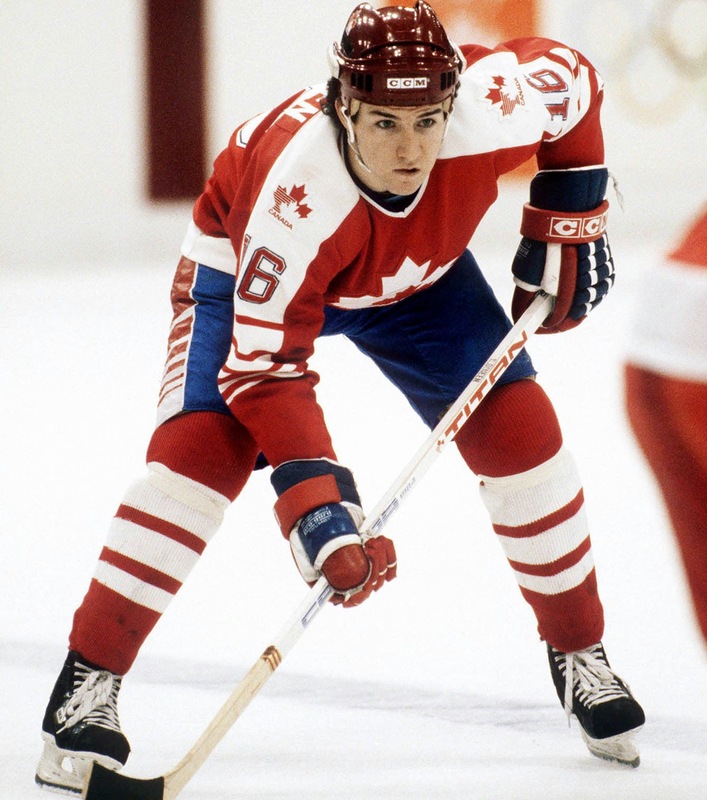 Kevin Dineen in 1984 playing for Team Canada. Team Canada had some firepower entering the 1984 Olympic tournament. Their top line was made up of Pat Flatley, Kirk Muller, and Carey Wilson, while their defence was anchored by Jim Patrick (who played for King on that 1982 World Junior championship team), Doug Lidster, Bruce Driver, and Jean Jacques Daigneault. Their top goaltender was, and still is, one of my all-time favourite players: Mario Gosselin, and he stood on his head for Canada. Kevin Dineen was also part of that renewal. He played two seasons with the University of Denver Pioneers, where he had been captain as a sophomore, before joining Team Canada in 1983. Back then, the Olympic team drew many of their players from college hockey. The 1984 tournament was a marathon. Canada played in Group “B”, opening with a 4-1 win against the Americans, followed by an 8-1 beating of Austria, a 4-2 win over Finland, and an 8-1 win over Norway. The only team standing in the way of finishing first in the pool was the vaunted team from Czechoslovakia, considered the second best team in the world after the Soviet Union. The Czechs proved it, dominating from the opening face-off, and skating to a 4-0 win. The top two teams from each pool advanced to the medal round, where they played the top two teams from the other pool. The results from the round robin also carried over. That meant Canada already started 0-1, with that loss to the Czechs. Team Canada opened the medal round against the Soviets, who won 4-0. They could still win a bronze medal with a win over Sweden. I was in Grade 9, and anxiously awaited the results. I kept asking my teacher, because they had the game on in the staff room. He broke the bad news to me – Canada had lost 2-0. We finished fourth and out of the medals. When I got home, I discovered the game was marred by a controversial incident involving Flatley and the referee. The first thing I heard was Flatley had been ejected in the second period, the only player kicked out in the entire tournament. He claimed the referee took a dive. When I saw the highlights, I had to agree with Flatley. It seemed he brushed the ref as he turned to go back to the bench. We’ll never know what Flatley’s presence would have done in the last half of that game. However, he was Canada’s second-leading scorer and one of their emotional leaders. It was hard not to believe Flatley’s story because international hockey, especially back then, was officiated by the Keystone Kops. The referees could not keep up with the play, and bought every dive out there. Worse, they seemed to dislike the physical style Canada played and penalized them for “penalties” that would never be called in North America. The incident would have marred the Olympics in any event, but happening in the de facto bronze medal game just sullied the whole tournament. Hey, I still vividly remember it 30 years later. United States for the gold medal at the Sochi Olympics. So this, along with the fact Dineen was held pointless in those 1984 Olympics, was the backdrop to his appointment to coach Team Canada’s women, mere months before they had to travel to Russia. He did not make an auspicious debut. The Canadians dropped every game to their top rival, the Americans, in an Olympic tune-up. He stripped the captaincy from Hayley Wickenheiser who many consider the greatest women’s hockey player ever, and gave it to a relative unknown. He changed the culture on the team. When the Olympics arrived, Canada mowed through everyone in the round robin, and beat the Americans to finish first. Still, everyone on Earth knew they would face Team USA in the gold medal final – which they did. The round-robin game was a classic, but that gold medal championship was even better. Then with 3:26 remaining Brianne Jenner ploughed through the American defence and made it 2-1. Canada pulled their goalie for an extra attacker. The Canadians tried to keep the puck in the American zone, but the linesman got in the way, and the US shot it down the office. Commentator Cassie Campbell called it a travesty if the puck went into the empty net. It hit the post. Canada would gain control and Dineen called time. He knew exactly what he wanted – three centres on the ice. It worked as Marie-Philip Poulin scored with 55 seconds left. Canada had improbably erased a two-goal deficit to send the game into overtime. They had gotten inside the heads of the Americans. Early in overtime, both teams had their chances, but again it was Poulin who won Canada gold for the fourth straight Olympics, with a goal 11:50 into overtime. The women all poured on the ice, while Coach Dineen stood behind the bench. It was their moment to celebrate, not his. When the camera focused on him, all I could think of was how he had waited 30 years for his gold medal. Some day I would like to ask him if the wait was worth it. I would like to think it was.